So you’ve tried Create React App, and maybe you’re thinking, “Sure, it’s nice and all, but what if I want code splitting, universal architecture, and a powerful router with zero configuration cost?” If so you’re in luck. 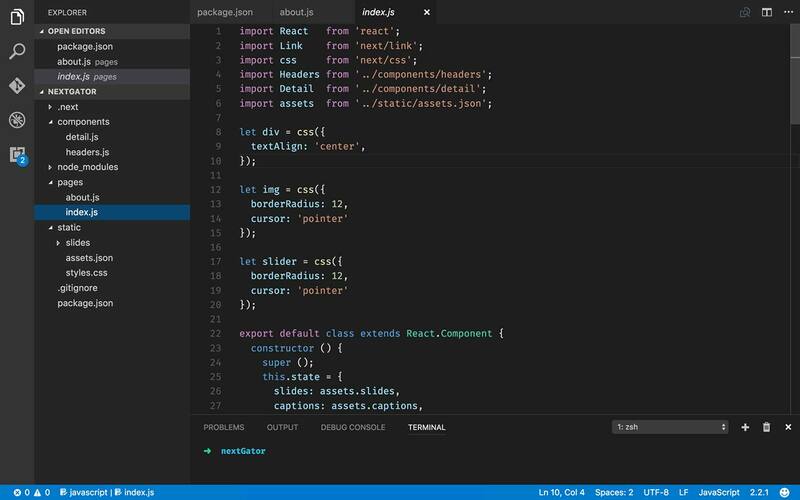 Enter Next.js from the next-level engineers at Zeit, a dead simple boilerplate for hitting the ground running with some of React’s most desireable features, tax free. Now go ahead and add a few directories: pages, static, and components. And that’s it. You’re configured with all the bells and whistles. Let’s dig into how it works. The first thing to note is that every .js file in the pages directory will be routed automatically — index.js routes to /; bite.js routes to /bite; and so on. This is also where your code splitting happens, with each discrete page getting a discrete bundle complete with scoped dependencies and server rendering where applicable. Next uses a CDN to leverage the browser's cache for efficiency in serving React. 🚀 It has a local fallback and can be turned off. We could leave it there, and things would be cool as they stand, but wait, there’s more. And therein lies your lazy-loading. Use Next’s Link component where applicable and the machinery beneath will take it from there. Furthermore, the astute observer would take note of that query string on the href, and that astute eye would be rewarded. Clicked Links receive a prop called url, on which the query can be accessed. This is a fine moment to revisit that components directory. With pages doing all this heavy lifting you’ll want a place to stow your more modular odds and ends to keep your routing clean. The Head component allows you to dynamically reconfigure the document head. Mighty useful. Similarly useful is the team’s inclusion of the Glamor inline CSS module. The old ways work, too, all the way to vanilla objects and require statements, but it’s a nice touch. ⚠️️ It's worth noting that Next is approaching a major release (2.x.x) that will change aspects of its API and that the readme on Github is out of sync with the version you're installing via npm (^1.2.3). And for our final trick, let’s bring it all together with a little data fetching. Next.js holds out getInitialProps in all its async/await glory for your data gathering needs but makes no prescriptions for what other tools you use. All that really matters is you use something equally suited to the browser and the server since it’ll run on both. All that remains is to fire up your dev server care of npm run dev, point your browser to port 3000, and say hello to simplicity in its most sophisticated form. 👉 If you think that's cool, wait till we deploy it.